Another noted Irish neighborhood was on the north side around the intersection of State Street and Chicago Avenue. One of the lesser lights of Irish immigration was Dion O'Banion who owned a flower shop just across the street from Holy Name Cathedral. O'Banion, the north side rival of Al Capone for control of Chicago's bootleg alcohol trade in the era of Prohibition, was born in that area. Some called the neighborhood "Kilgubbin't (aka "Little Hell") an area of Chicago which Ellen Skerrett says was "composed of peasants who had been evicted in the 1840's from Kilgubbin, County Cork." Ellen says that Kilgubbin "was centered along Market (now Orleans) Street between Kinzie and Erie [expanding] north of Chicago Avenue in the 1850's and 1860's". 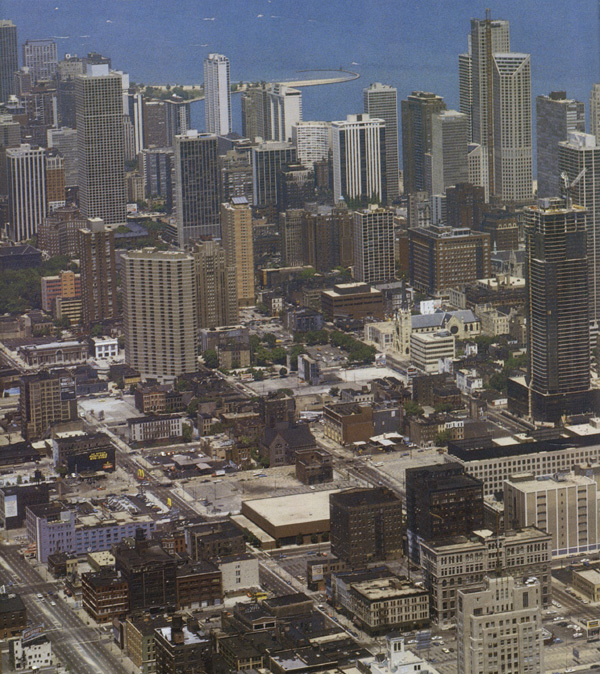 This section is designed to relate Chicago's postcard photos to its Near North Side interior. 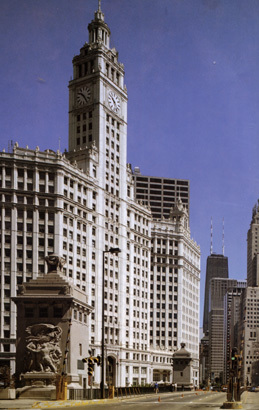 Our pivot point is the Wrigley Building (left): the section of the Michigan Boulevard bridge in front is a popular rendezvous locale in Chicago films. This view continues (on the right) and is reflected to the south along the eastern margin of what is properly "Downtown" (the Loop ). 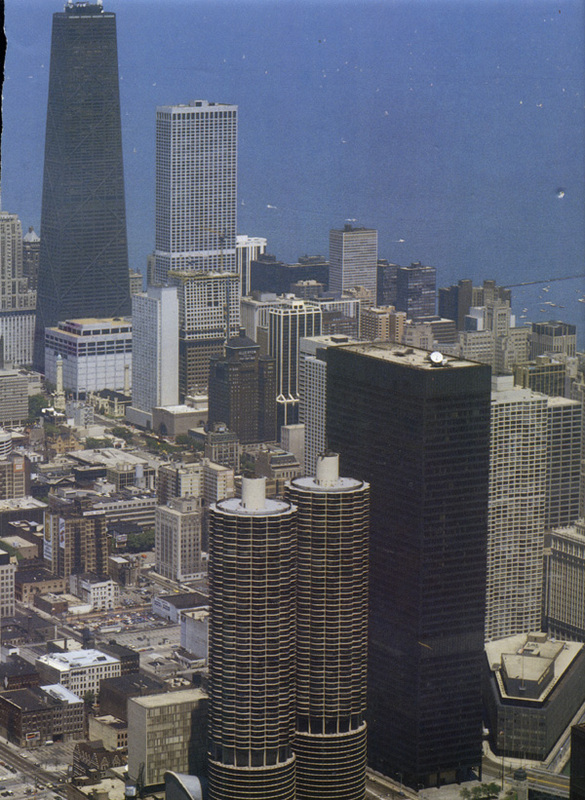 (The top of Wrigley may be seen in the right foreground.) As implied by the bridge, these views are separated by the Chicago River, which also forms the lower (southern) margin common to the two views stacked below. Panels to the right represent one continuous view (resumably from Seaqrs Tower) of Chicago's Near North Side (and my earliest home). From behind Wrigley (top panel), we are taken up Michigan to John Hancock, with the Water Tower marking the east-west transit of Chicago Avenue. A small piece of bridge by the Sun-Times Building marks the northern continuation of Wabash Avenue, our view of Michigan partially is obscured by other riverfront property: the IBM Building (on State) and the twin Corncob Towers (Dearborn). The west side of Michigan begins to lower the silloute (if not property value) and eventually the appearance of our landscape. The north side of Chicago Avenue continues west to mark the southernmost extent of "good things." With the notable exception of Holy Name Cathedral (and an unidentfied high rise), south of that (down to the river) marks in 1987 the Hiroshima-looking slum I previously described. The west-most street droping south from Chicago is Clark Street: coming down we have Superior, Huron, Erie, Ontario, Ohio, Grand, and Illinois. Finally Clark appears to run into the Board of Education (which is actually on LaSalle, the leftmost street in our view). LaSalle terminates downtown in the Board of Trade , for years (at 44 stories) our tallest building. To conclude the sometimes dismal implications of this photo collection, I offer for relief the following view of the Boulevard's northern extension becoming (at Oak Street Beach) Lake Shore Drive (LSD, below on the right). The land extension into the Lake above the Beach also marks the interior start of Lincoln Park, including its Zoo (on the left). Between the beaches and the park, all within easy walking for us Near North slum dwellers, we were hard put to be in daily perpetual misery. In fact there are times I'm sure that just being in Chicago would be reunion enough. 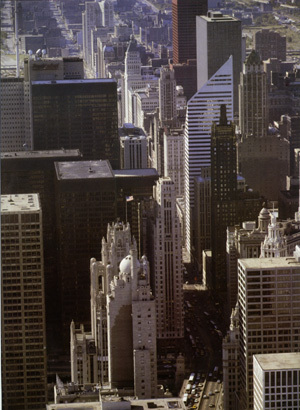 photos from Chicago (1989) in Crescent Books' A Photographic Journey Series .